Help! Missing Kefir Grains? Here's How To Find Kefir Grains! …the grains are nowhere to be found. Are they at the bottom? The middle? And uh-oh, what if you can't find them and someone ends up eating them??? Because… even though I've told you that “they're usually floating at the top”, yours certainly aren't at the top. I keep ending up not being able to find my kefir grains in the finished kefir. They are not very big and they don't float. I use a strainer, but it is difficult to look through all of the kefir. Does anyone have some advice for me? I can assure you — they are in there somewhere; you just have to know how to find kefir grains. Anna, not only do I feel for you… I've had to eat my words recently! I've been making kefir with 2 grains (the grains are the mother culture) — one of them floats and the other sinks. One of mine isn't floating because it's heavier. I'm rehydrating it from being dehydrated — which is often how you buy them, like here — and it's not as buoyant as grains that are fully plumped up. So anyway… this is not a problem. The grains can still be found. And let me assure you, they are still there. Here's how to find those missing kefir grains. In the video for this #AskWardee (above), you'll see me fishing out my “lost” kefir grains at the bottom of a batch of finished kefir. I'll show exactly how I go through the following process. And here are the steps to find kefir grains. Again, see the video recording above to see me do it. With a spoon, scoop out any grain(s) that are floating at the top. Put in jar #2. Pour a cup or 2 of the finished kefir into the glass measuring cup with spout. Use a spoon to gently fold the kefir and see if you can find any grain(s) in it. The grain is solid while the kefir falls apart as soft curds. If you find grain(s), transfer to jar #2. If you don't find grain(s) with a spoon, change to a whisk. Whisk gently to smooth the kefir, again looking for grain(s). If you find grain(s), transfer to jar #2. Use the spoon to again go through the curds (now smoother because they're whisked) to find the grain(s). If you find grain(s), transfer to jar #2. Pour the whisked, strained kefir into jar #3. Repeat steps 2 through 6 until you have searched the whole batch for the missing kefir grain(s). Pour fresh milk into jar #2. Cover with a cloth napkin and rubber band and let ferment (a new batch of kefir). Cover jar #3 and put it in the fridge to chill. 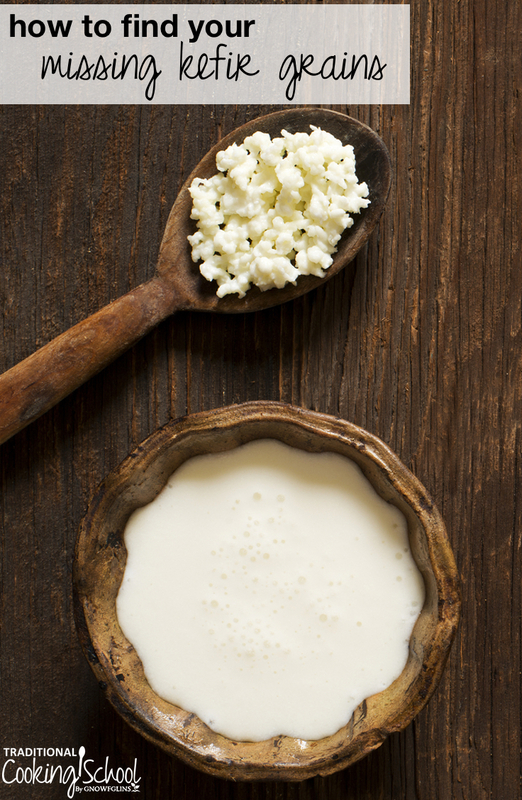 If you're new to traditional cooking or culturing, you may not know what kefir is. So I want to take a few moments to explain what's going on here. And its “mother” — the culture that helps you create it — are grain(s) that are a lot like rubbery cauliflower. You plop the grain(s) into milk (the best you can get), cover the jar with a cloth napkin and rubber band, and leave it to culture at room temperature for a day or 2. Then, you remove the grain(s), refrigerate the finished kefir, and plop the grain(s) in another jar of milk to repeat the process. By the way, if you want a good yogurt recipe… be sure to grab my free thick raw milk yogurt recipe. It uses the yogurt culture AND also keeps the culture that’s naturally present in the raw milk AND it stays nice and thick. (Most yogurt recipes use pasteurized milk; if one were to use raw milk instead, it would turn out runny.) Go here to get the free recipe! You can check out the Cultured Dairy & Basic Cheese eCourse inside Traditional Cooking School or my Cultured Dairy & Basic Cheese eBook and Video Package to learn how to make kefir. Dairy Kefir Grains from Cultures For Health — my recommended source! #AskWardee 044: What's the best cultured dairy for probiotics? Have you ever had to solve the mystery of missing kefir grains? 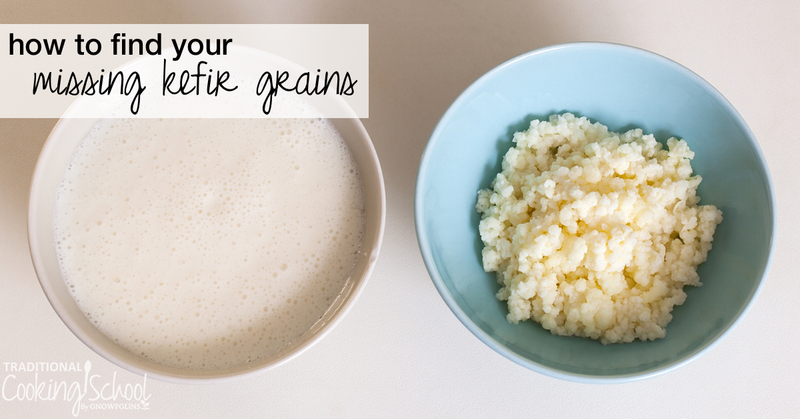 Do you know how to find kefir grains? I strain my kefir through a small non-metal strainer into a bowl with a spout. The kefir grains are large enough NOT to pass through the strainer. Then I pour the strained kefir into its new jar. I rinse the grains with a tad of fresh milk and put them in a jar with more fresh milk to keep them “happy” until I am ready to make the next batch of kefir. The bowl used for the straining is then briefly rinsed with a tad of water and either given to our pup, who is VERY happy to have her sharif kefir or poured at the base of a needy plant. We ALL win with kefir in our diet! Thank you, Wardee, for your detailed coverage of this topic. God bless. Thanks for sharing M.! I love your method, too, and I have used that on occasion. I seem to make more of a mess that way, though! I love your tips about rinsing the bowl with a bit of water and giving to pup ~ very frugal and healthy! Thanks! I start with my jar of ready kefir & two clean jars of the same size. Like the above comment I use a non metallic strainer which I put into a plastic canning size funnel that I stick on top of one of the clean canning jars. I don’t use a measuring cup. But first, I stir the kefir with a clean chop stick (of which I have several to stir with) mixing up my raw grass fed cows milk to see if it’s firm enough. During the cooler months it’s taking longer so I will come back later & stir again to see if it’s thick enough. I clean my chopstick in water & air dry. When it’s thick enough, I pour an amount into the strainer & tap it into the jar & stir it with a small silicone spatula. I do this until it’s all poured into the jar & the grains are left in the strainer. I then dump those grains into the third jar & pour on the milk & repeat the process. The only things I have to clean are the plastic strainer (cheap one from WalMart) the canning funnel & the little spatula. I have just started using the tiny single grains while I needed to slow down the process to make less for a time. It works great. Also, when I get too many grains & take out the big ones, rinse in filtered water & set onto parchment paper folded into a slight packet (not airtight but covered) & set on the counter to dry. I break up the largest grains into smaller ones. When dry in a few days I put them into a clean paper envelope or parchment envelope & put into a tin. If you have any questions please ask as I might not have made myself clear. I’m just learning as I go from the internet. Good job Wardeh! I would not give up yet. As Wardee mentions in this episode, it can take a long time (weeks, even months) for dehydrated grains to rehydrate creating your “mother”.